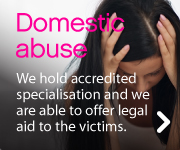 DS Legal is contracted to the Legal Aid Agency to provide Legal Aid services to clients in appropriate cases. We hold legal aid franchises in all three offices. Legal Aid can help pay for your legal advice, family mediation or representation in court or at a tribunal. Recent changes to Legal Aid means that this type of funding is now only available in limited circumstances and you should first check whether you are eligible. The gov.uk website provides useful guidance on Legal Aid and the online calculator will help you to assess whether you would meet the means criteria.